A self contained, extremely well appointed modern cottage surrounded by native bush and farm land. Quiet and secluded with abundant bird life. For added interest, the main trunk railway line is not too far away. 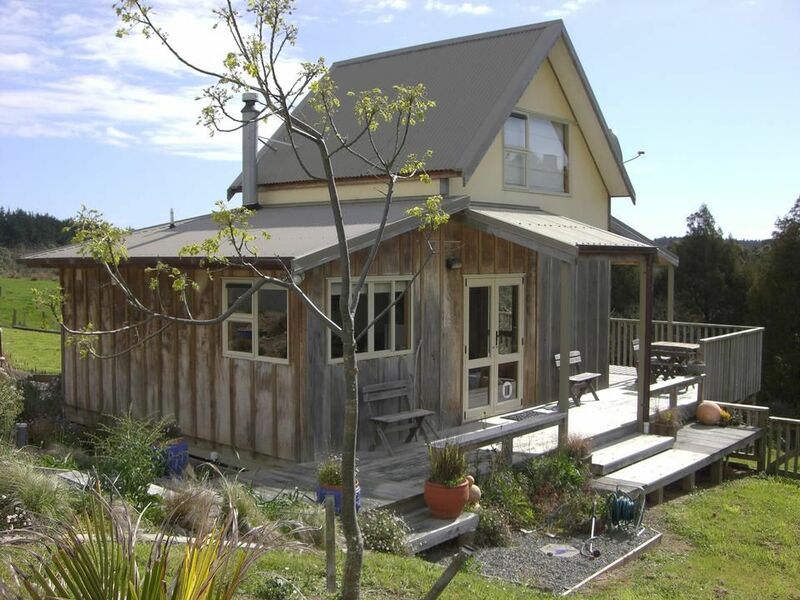 The cottage is an easy one hour drive north of Wellington, five minutes north of Otaki. Come and visit our slice of paradise and the many other attractions Otaki has to offer. The excellent Outlet shops with bargains for all, have a walk on the beach and try some beach combing, with lots of fresh sea air. If you are feeling energetic try a bush walk up Otaki Forks or Crystals Bend and have a swim in the Otaki river. Try the Otaki Races for a bit of fun or a lazy time fishing on the river or the beach. Facilities include, BBQ, cook-top and oven, wood burner, spa bath, Covered deck for outdoor dining and to view the native bush and bird life. Just bring your book, favorite bottle of wine, put your feet up and relax in this quiet secluded getaway. Semi-retired lifestyle couple, with cottage, sheep, limes, avocado's, macadamia and fruit trees with large vegetable garden area. Secluded, quiet and beautiful. Highly appointed with everything you need from home. Cosy fire-place for winter and BBQ and brazier for warm summer nights. The cottage is well designed and nestled in a stunning regenerating piece of protected native forest. Incredible bird life only meters away. Our guests enjoy the finishing touches that contribute to making each stay memorable. This beautiful bach was definitely an escape from the rat race. Situated in a small bush area with only birds for company (and the odd train passing by) it was very relaxing, peaceful and a very welcome retreat from everyday cares. Fully equipped with all we needed including a wood burner which we didn't use due to sunny weather. We can definitely recommend staying here and hope we may be able to return one day. This was a peaceful sanctuary. I was in Otaki for work that involved a lot of networking and talking so it was lovely to come "home" to the quiet of the country, beautiful bush and the sounds of nature. The house has everything you need for a comfortable stay. Beautiful and peaceful getaway. Thank you! Property was exactly as described. Would love to come and stay again! We enjoyed our stay and our host was friendly and helpful. Gorgeous rural location and a short drive to local amenities. Would happily return. Lovely, peaceful retreat. Just what we needed. Had a great stay at the cottage, nice and quiet with beautiful nature surrounding. Couldn't of asked for anything more except for a longer stay. Will be back as soon as we can. The cottage is situated @ 81 Forest Lakes Road. Just past the rail under bridge on the left you will find our driveway entrance.Proceed 500m up drive, with cattle yards to your left. Turn right at end of drive, follow the sign for Pukeko Cottage - our house is at the top of drive. Go past this and continue down to cottage some 250m away with a roundabout.